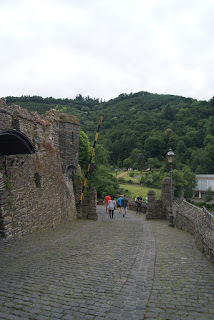 Last Tuesday (July 5th) Alex and I loaded up the children and drove to the nearby town of Cochem (pronounced Ko-hem) in order to explore its castle, the Reichsburg. It was about an hour's drive from our village, with most of it being windy back roads. There was a lot of narrow and steep curves, which really unnerved me from the passenger seat. I don't think I'll ever get used to these German roads. The view when we first got into town was incredible. To our right was the Mosel river with a bike/running path along the water's edge with houses built right onto the sides of the mountain. There was a long bridge straight ahead and plenty of tourists-y shops to our left. Life was thriving there, with couples walking hand in hand through the town, kids munching on ice cream cones, and dogs on leashes out on midday walks. It was picturesque. Finding parking was a bit of a challenge. Germany was not designed for a lot of automobile traffic, but eventually we drove upon an available parking garage right in the center of town. It cost us 5 Euro for 6 hours of use; we might have been able to spend less for a shorter time, but we wanted to be safe and leave ourselves enough of cushion for exploring. The first order of business for us was to find some lunch. I had heard positive reviews about an Italian restaurant located nearby called La Baia, so we plugged it into our phone and went in search of the place. Fortunately, it was only about two minutes away from the parking garage on the 2nd floor of a hotel, and it was easy to find. We had the joint to ourselves, and the server told us to sit wherever we wanted. Alex and I chose a table outdoors with an incredible view of the city. Sitting at the table, being able to kick back and take in the hustle and bustle of Cochem was one of my favorite parts of the day. Of course, ordering our food was a bit of an adventure since the menu was in German and the server spoke zero English. Thank our lucky stars, Alex and I had a Google Translate App on our phones that used the camera to capture words and translate them. It worked well enough to let us figure out some key words so we knew not choose anything too crazy. Alex and Landon got a salami pizza, which was pretty tasty. 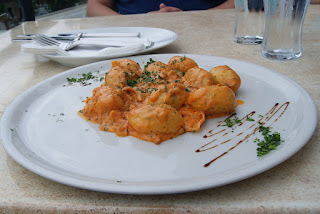 I got the gnocchi cooked in a creamy tomato/cheese sauce with bacon and pine nuts. This was the clear winner. It was phenomenal! I had never had gnocchi outside of Olive Garden's soup dish, so it was great to discover them stuffed with Ricotta cheese. The only disappointment I faced was the fact that the restaurant was an hour away and impossible to go back to on a regular basis. Then again, perhaps that's for the best. I might develop a gnocchi addiction if La Baia was down the road. "Come on, kids, we gotta go get Mama's weekly Gnocchi fix!" When lunch was complete (the total bill including the suggested 5% tip was 30 Euro) Alex and I walked through the town for a bit in an attempt to walk off all those carbs we'd just scarfed down. Our main goal for the day was to visit Reichsburg Castle, which was accessible via two ways. There was a shuttle bus that would take you up to the castle for 4 Euro a person or there was a pathway you could climb up to get to the top. Alex really wanted to do the walk in order to see the views as you go up. I was a bit hesitant due to having the toddler and baby with us, but Landon's always been one for exploring so I was talked into it. 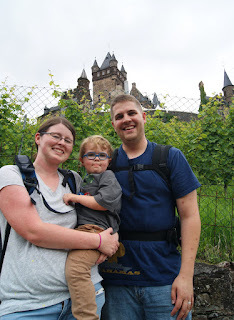 The castle supposedly sits 300 feet above the Mosel River, and while the climb up was steep it didn't take nearly as long as I thought it would. Approximately 15 minutes after we started the climb, my family reached a pathway that went around the side of the castle and provided us with our first up close view of the place. Noteworthy story about this photo. We came upon a couple trying to take a picture with the castle in the background, and Alex offered to take it for them. When he was ready to take it, he began counting in German. The guy got SO EXCITED to hear Alex counting in the native language. He was so encouraging and was almost proud of the fact that Alex was making the effort to speak in his native tongue. And it just made me kind of stop and think about what the situation would have been had the roles been reversed and we were in America. Honestly, we probably wouldn't have paid any attention if a German was counting in English, because we're a little bit selfish like that. It wouldn't have dawned on us that these folks were making the attempt to communicate, and we surely wouldn't have thought to say words of encouragement. Kind of a life lesson right there. I wish every American could spend some time abroad to get a better perspective on life. Getting back on track, the castle in question for the day is one of the smaller sites in the surrounding areas. 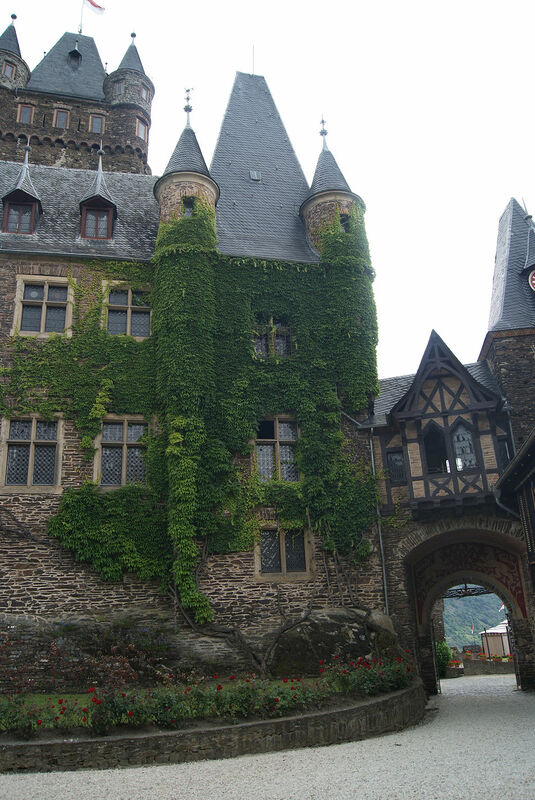 Back in the 12th Century, another castle stood in its place and was used to collect taxes for ships passing along the Mosel. In 1689, though, the Romanesque building was destroyed by the French. The ruins remained until 1868, when a Louis Ravene built a new summer home in its place in a neo-Gothic style, which was the building we saw that day. The very best part of the castle was the view of the area from the top. It was absolutely breathtaking. 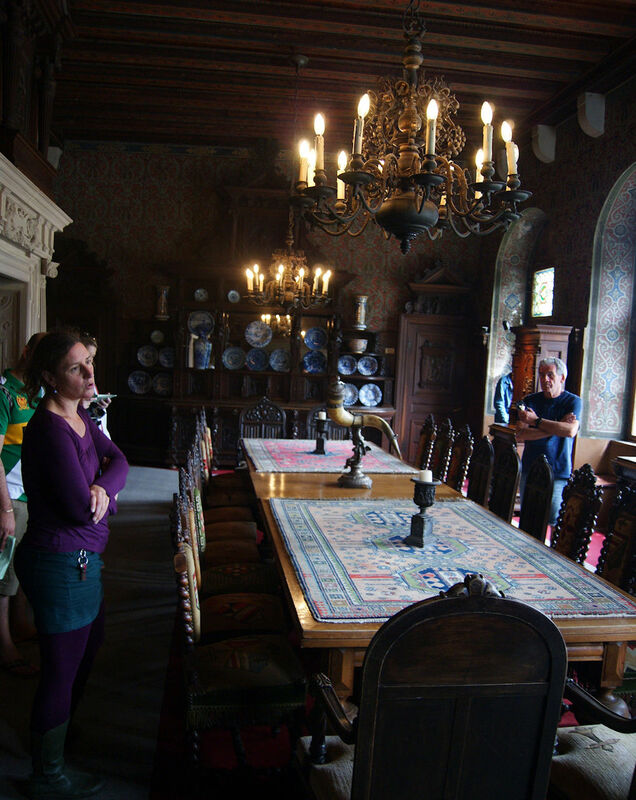 We decided to pay for the tour of the castle (12 Euros total) in order to see the interior rooms and the courtyard. The tour was about 40 minutes long and while all in German, they did provide a printed handout in English summarizing the guide's spewl. 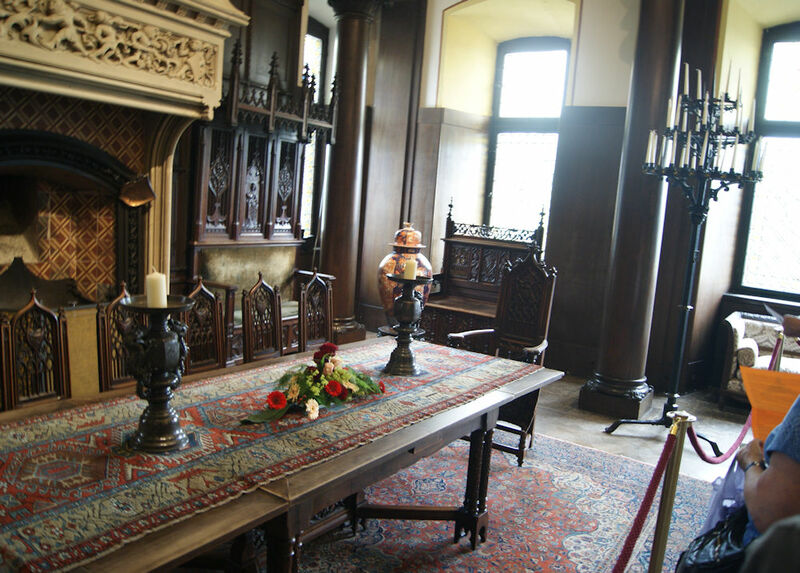 The kids did well on the tour, all things considered, but I'm not sure I'd recommend the event to anyone else visiting the castle. 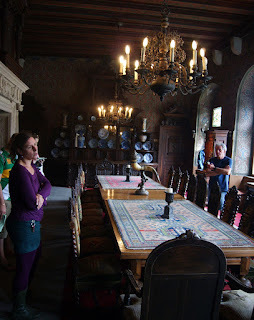 There were some interesting features, and the rooms were gorgeous, but I believe there are grander castles that are better organized than ours seemed to be. In the end, the most noteworthy point of the Cochem Castle was most certainly the view from the top of the hill. If anyone were to ask my opinion on the place, I would tell them to definitely take advantage of a cool German day and make the trek up to check out the views. That was completely worth it, one of those instances that make you go, "Wow, I'm fortunate enough to see such beauty in my lifetime. I've really been given a gift to live here and call this place home." But like I said, I'd save the couple Euro and skip the tour. Give youself some extra spending money for the shops at the bottom of the hill. Because there was quite a few of them to be had. The window displays showed some really amazing souvenir pieces, however most looked very fragile and very expensive. Two qualities I try to avoid at all costs with two young children. Therefore, there was no more than cursory glances from us, but we did stop at an ice cream shop to get Landon a scoop of gelato to go. We must be doing this more frequently than I thought, because he tugged on my shirt and informed me of exactly which flavor he wanted. Alex and I hadn't had a milkshake since we moved out here, and we figured that would be something we could enjoy while walking back to our car, so we both ordered one. European milkshakes are NOT the same as American. It was basically a big glass of milk with a scoop of ice cream sitting at the bottom of the cup. And while I do enjoy a nice cold glass of milk from time to time...not quite what I had in mind in that moment. 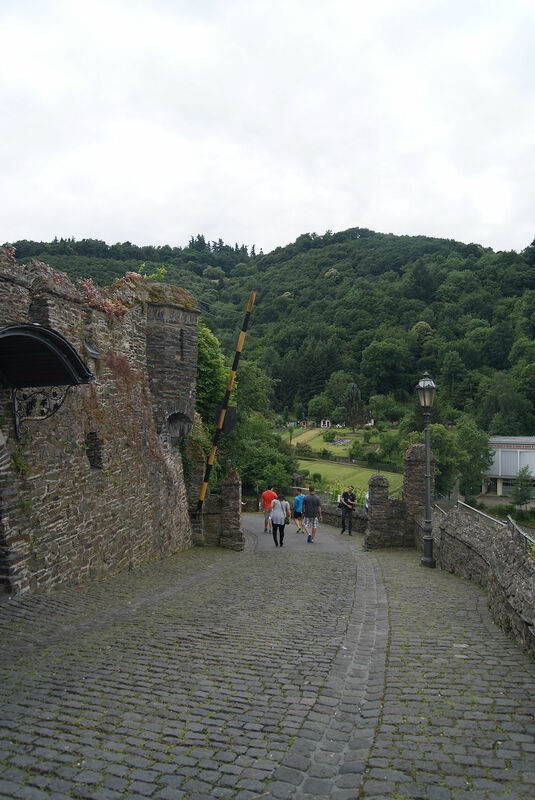 Overall, my family spent about 5 hours in Cochem at a cost of about 54 Euros. Well, well worth it for a quiet little family day trip. The town was charming, the encounters with locals all friendly, and the experience appreciated. I can only hope we are able to take more little day trips like this again throughout the summer before the cool weather blows in and takes the extra daylight away.